Our Terms and Conditions allow the below Lesson Plan and Worksheets to be used for immediate family use ONLY. Use beyond this is a violation. I Peter 5:8-9 (NIV) - Be alert and of sober mind. Your enemy the devil prowls around like a roaring lion looking for someone to devour. Resist him, standing firm in the faith, because you know that the family of believers throughout the world is undergoing the same kind of sufferings. Taking Care of Me: Where are my pants/jeans/skirt? 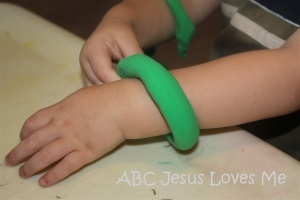 - ABC Book: Color the Shepherd worksheet with a blue jumbo crayon. For the next 12 weeks, the child will be creating a Color Box each week by collecting in a box or sack items that are the color of the week. For this week, walk through your home or classroom and collect blue items to place in the container. Play Dough Shapes - Roll blue play dough into snakes and lay on the Triangle worksheet to form a triangle. Allow the child to play with the triangle as you discuss the shape. - Pinch a cotton ball in a clothes pin. Assist the child in dipping the cotton ball into blue paint to stamp on the Sheep worksheet. - Find pictures of sheep in the books that you read. - A sheep says "baa." - Crawl on the floor and baa like a sheep. - Point and count the sheep in the book. - After listening to the book several times, allow the child to finish the sentences with the animal sounds. While in the bathtub, give the child measuring cups to pour water. This play helps the child learn how to control the water as she pours. Discuss hot and cold as you sign each. March around the room as you sing "Mary Had a Little Lamb." Encourage the child to lift his knees as he marches.